High Attenuation RF / EM Portable Test Enclosure Results Certified in Independent Testing. High RF / EMI attenuation for a Select-A-Shield™ portable tent test enclosure has been 3rd party certified in recent testing. 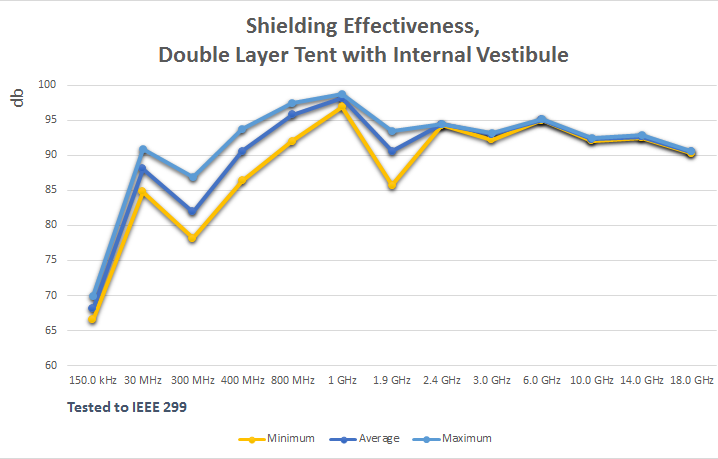 Results included -85.7 dB minimum shielding effectiveness (SE) at commonly used cellular and Wi-Fi frequencies. Select Fabricators’ Portable RF / EMI Shielding Tents are effective for Radiated RF Immunity Testing and Emissions Testing. Shielding performance data must be carefully scrutinized to assure the enclosure as used will meet requirements for a specific application. Select Fabricators used the IEEE® 299 standard test, conducted by an independent test lab on a complete assembled system including installed components operating under typical conditions at various frequencies measured through the tent wall at multiple locations in the tent. The minimum readings indicate shielding functionality that can be expected in use. SFI’s design team have customized high attenuation portable test enclosures for specific applications; integrating high-performance filters for AC power configurations up to 100 Amps and using multiple communications protocols including Gigabit Ethernet and USB 3.0 while assuring high attenuation performance. Select Fabricators uses multiple layers of its Nova Select™ conductive fabric for the basic RF test enclosure construction. An internal or external vestibule is an important part of the design. The vestibule provides entry and exit for personnel during test procedures without compromising the integrity of the test environment using the patented (US 9,029,714) single door sealing system that uses two rows of conductive magnets with ROHS compliant Nova Select™ fabric as a conductive gasket. To complete the system, ventilation, high-performance filters, hardened lighting, and aluminum frame were designed and installed prior to testing. This RF shielded chamber system was tested and certified to Select Fabricators’ and its customer’s complete satisfaction. 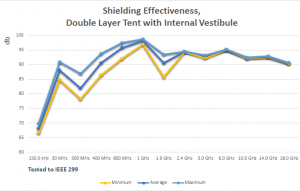 The shielding effectiveness, independently certified, can be completed for any Select-A-Shield standard or custom tent enclosure system with full test results. Collapsible Select-A-Shield high attenuation RF / EMI test enclosures conserve space when not in use and are easy to transport. RF and EM shielding portable chambers easily assemble and disassemble, typically in just over an hour. It can be taken down and stored when not in use, saving valuable lab space. The tent and frame fit into hard shell rolling cases and their lightweight design allows transportation via standard shipping services. 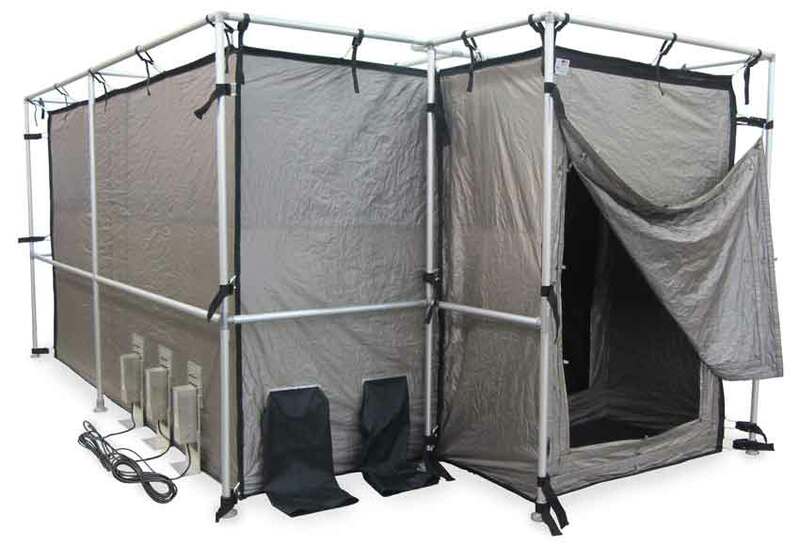 Unlike hard-wall enclosures, this portable tent can be used in multiple locations, including remote sites, and EMC test labs. Made in the USA of US materials. Founded in 2000, Select Fabricators, Inc. is the premier US manufacturer of RF portable, collapsible fabric shielding solutions including signal reduction enclosures, pouches and curtains; as well as the procurement of state-of-the-art materials, research, design, manufacturing, fulfillment and compliant production to stringent quality standards and complete project management. With capabilities in industrial sewing, heat sealing, ultrasonic welding, pad printing, die-cutting and cleanroom secondary operations, SFI delivers a wide array of solutions to the aerospace, forensics, homeland security, law enforcement, industrial, medical, military and wireless communications industries.